Over the past couple of years, I’ve created a few photobooks using Blurb and have always been very happy with the service and the product. In addition, their Booksmart software has got better especially with the ability to customise the templates or even design your own. This has opened up a huge range of creative options for your page layouts, although it was possible to do this before if you wanted to design your book in photoshop and import the pages in as jpeg pictures. Blurb have produced a book on book design which is available on their website ‘How To Make A Gorgeous Photo Book’, which is worth buying if you’re serious about designing your book. It won’t turn you into a book designer, but it will give you some good tips. It’s also worth looking at some of the books produced by other people that are for sale in the Blurb bookstore, and also at books in your own collection or in high street book shops. What follows below isn’t a guide to using Blurb’s Booksmart software – I recommend the Blurb Forums on their website for that. What it is, is some ideas I’ve picked up, on planning and designing books while creating Mechanical Landscapes, my latest book. For me, this was easy as I was looking to put together a retrospective of my best Urban / Industrial Exploration photos. The book was for me as I was planning an indefinite break from this type of photography, so I wanted to put something together as a ’best of’. However, I’d decided that I would make the book available for sale on Blurb via my website in case anyone wished to buy a copy. Making money was not the goal – my plan was to sell tham at cost. A previous book I’d done was a college portfolio and for that, a statement of intent was required and this is a good thing to do as it puts the book into context, indeed most published books have some form of introduction. If creating a book for your own enjoyment, this probably isn’t necessary, but it can provide a useful reference point for keeping the book on track, especially when it comes to selection of photographs. 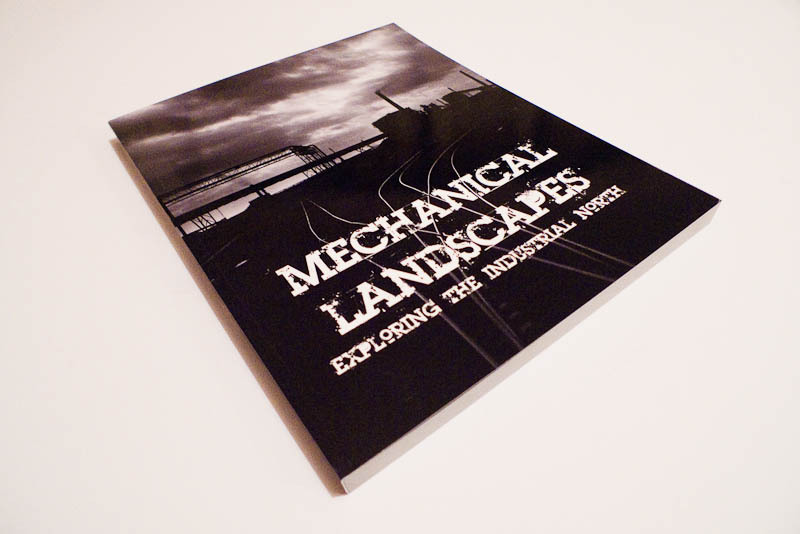 You’ll also want a title – I chose Mechanical Landscapes as it sets the tone for the collection of photos in the book. However, for my annual photo album books, I just use the year 2008, 2009, etc. This is pretty much the first thing you choose when creating a book in Blurb’s Booksmart software. I’d been toying with different layouts for weeks, before I decided on 8 x 10 portrait. The reason I decided on that was because I take a lot of photos in portrait format, and I always think that they look lost on a landscape format page. In addition, landscape format photos can be done across two pages so you’re making the most of the space available (providing you don’t mind a spine running down the middle of your pictures). This wasn’t too much of an issue to me as I kind of had a long short-list in my head of images. I use Lightroom as my cataloguing software, so this made accessing and viewing the images quite straightforward, and I simply added them all to a collection so that I could keep track of them. I know that you can do the same in Adobe Bridge, and I think Aperture has the same functionality. As I’ve got plenty of hard drive space, I simply exported all the images in the collection to a separate folder which made importing them into Booksmart easier than messing around looking for individual images in individual folders. It’s easy enough then to just delete the folder of exported images once you’ve finished the project and keep the originals intact. In terms of image selection criteria, well that depends on the individual, and on the goal of the book. 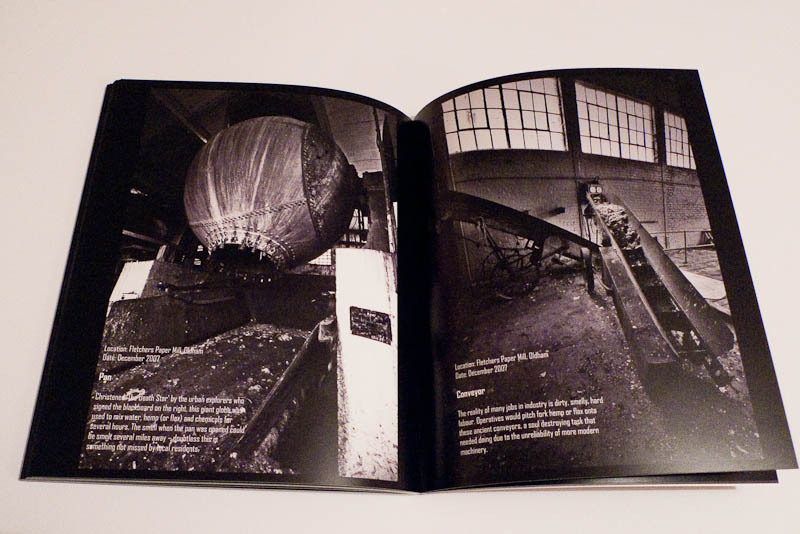 I not only had my very best images in the book but also ones that kept on the theme of the book. I predominantly used the existing templates in Booksmart, but took advantage of the ability to edit the layouts when required. This was particularly useful on the portrait format pages, as the text box is contained within the photograph frame, and sometimes I needed to move the text box as it was covering something significant in the photo, or it was impossible to read the text due to the colour behind. It’s worth mentioning that as the images are black and white, I’ve chosen to use predominantly white text, with some black text where white would’ve been rendered invisible by the background behind. As mentioned above, I put the landscape photos across two pages – to do this, drag and drop the photo onto one page, then go back to the panel of images and drag it again onto the other (or do it once, then right click it, copy it, then paste it onto the other). Lining the two sides of the picture up can be a pain – some people create one large photo in Photoshop, then cut it in half and import the two halves into Booksmart. That’s a good idea, but I’ve never done it simply due to the time involved in Photoshop beforehand. I simply line them up by eye using elements of the photo as reference points. I work on the basis that the very centres of the pages will be in the spine anyway, so any tiny misalignment isn’t going to be noticed unless someone is looking VERY hard. OK, so you’ve started dropping the photos in and it’s starting to look like a book! For my annual photo albums, I just put them in chronological order, but for Mechanical Landscapes, my alternatives were to either put them in by location, or by industry (sure I could have just put them in randomly, but I much prefer structure). I chose in the end to go by industry – Steel, Mining, Paper, Textiles, etc. Once in the chapters, the photos again needed ordering so as to get a flow. For the portrait images which faced each other across a spread, I tried to put images together that were either similar subjects, similar compositions, similar tones, or just looked right together! The final thing to consider was theire order within the chapter, and trying to get some kind of order or flow to them. Within the chapter, I tended to group them by location, but in general, the aim was to have a strong image at the start, middle and end of each chapter. Whittling the photos down was one of the hardest jobs, and it was something that I had to come back to time and time again. Over time, the ones that are unmovable really stand out from the weaker ones. The need here is to filter out not just the weaker images, but also on the basis of how they work as a cohesive collection. e.g. are they on topic, not just for the book but also the chapter? A useful feature of Booksmart is the ability to lock all the pages together. This makes it easy to delete pages and move them around quickly as they are bound together in 2 page spreads. My limiting factor was that I’d decided that the book would be a maximum of 160 pages long as the Blurb pricing structure goes up in 40 page increments, and as I’d decided that the book was going to be for sale, £21 was probably the maximum I’d stand any chance of selling the book for. As it was, that number of pages was probably the optimum number for the amount of photographs of the required standard. It’s good to get a second opinion here, but one of the weaknesses of the Booksmart software is that you can’t publish to PDF, so you can only show people the book on the computer you’ve created it on. My solution to this was realising that I had Microsoft Publisher in Office (that will publish to PDF), and I created a parallel book in here to email. This took a couple of evenings, but was worth doing, as it allowed me to print a copy of the book out as well, and there’s nothing like seeing it all on paper. This was something I’d wracked my brain over in the past, and for my college portfolio book, it was actually my tutor who spotted the perfect one, and it was one I’d never even considered. The criteria I used for this were: Something with impact – it’s got to catch the eye, so it needs something with strong composition, that complements the title or the subject, and sets the tone for the book. 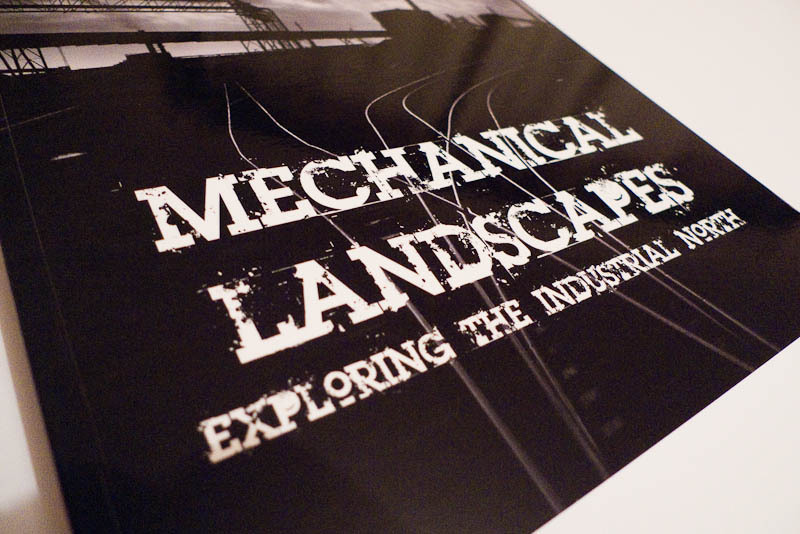 For Mechanical Landscapes, I like to think that the one that I chose met the criteria, as it’s black and white (like the photos in the book), it’s got an industrial landscape on (which is the theme of the book) and the rails help act in as lead in lines (although they are partially obscured by the book title). I’m sure that a professional book designer would have created something better, but I’m pleased with the result. For the ultimate in flexibility, do it in Photoshop, or get someone else to do it! Failing that, use what’s available in Booksmart. There are quite a few options in terms of where the text goes, and it can then be centred, aligned left, right, top, middle, bottom, etc. Think carefully about it’s positioning over the photograph – is it obscuring anything? Of course, you could just have a solid colour as a background, and even put no text on it if you have no imagination or are going for a real avant-garde look! 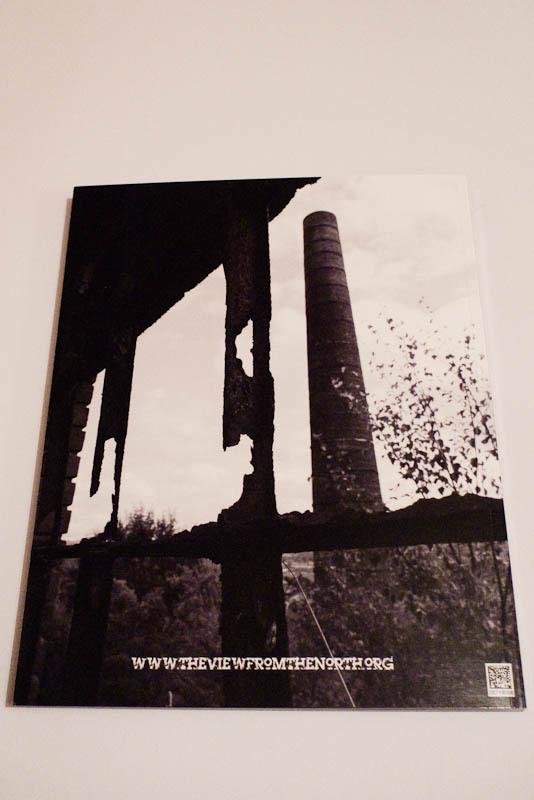 Don’t forget that books have a back cover as well. Do you want a full page image, one that is a solid colour with a smaller photo inset, or just a solid colour and text? An image should be a strong image but not one that is stronger than the cover image. Give the book one last read through. Remember, Booksmart doesn’t have a spell-check, so if you’ve any text you should read it through several times, or copy it into a word processor that has a spell check function. One other thing to check is the spine of the book. Over a certain number of pages (40 I think), Booksmart does (or it used to) automatically put in the name of the book in a default font. This has caught me out at least once, so do a proper review in the preview section of Booksmart, as once you’ve uploaded the book, that’s it! Upload, Order, Wait and Enjoy! OK, so the books done, now you’ll need to upload it. TIP: go put the kettle on and ake yourself a cup of tea, as this can take time, especially for a large photo book with lots of photos. When it’s done, you can then select the paper type and binding, and once you’ve paid, it’s out of your hands! Just sit back and wait for a large package to arrive! It’s well worth the wait to see the end result of the hours of time you’ve put in, and you can’t beat seeing your own photos in a book you’ve created!